In this episode of the MenChat series, Yahnathan continues his discussion with author Kevin S. Carr by addressing the question: What are bad habits that will chase away an ideal partner? 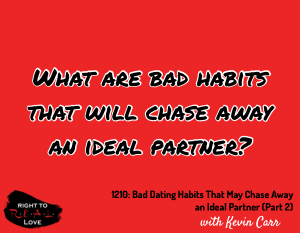 What are bad habits that will chase away an ideal partner? Why you must be intentional about developing the right dating habits. The importance of building relationships on the right foundation. Differences between wholeness and perfection.